Highly recommended. Close to Oban, lots to do and see nearby. Great if you have a dog and fantastic view from the well-equipped cabin. Lovely lodges to escape to. Everything you should need for your stay. Cosy & warm with lovely views. Everything is perfect: the house is great, the landscape is impressive and Jim is very nice and kind. Great site to use as a base with wonderful views over the loch and nearby hills /mountain. The lodge was perfect for a couple and had wonderful views at the front. There was a veranda at the front of the lodge with modern outdoor furniture and everything was clean and in working order. The owner was very friendly and helpful. A great location for touring and walking. Stayed a week in Fox Den Lodge. Owners very helpful and friendly without being intrusive. Lodge was very clean and comfortable but was looking a bit dated. Would benefit from some upgrading.. Excellent location for walking and touring. Food and service at Creagan Inn very good. Great location, fantastic dog friendly accommadation. Lodges could do with a bit of an update, but did not affect our stay. Great location for Munro bagging, cycle track from Oban to Fort William. Fantastic pub (Creagan's Inn) superb hospitality , great food and also dog friendly within easy walking distance. We were fortunate to have great weather during our May stay, decking was a great suntrap, with fantastic loch veiws. My husband bagged the three local munros, whilst I enjoyed the sun. Will definately return, cafe at Castle Stalker View also worth a visit does good food, with great views. A relaxing location, the lodges are a few years old but nonetheless are comfortable and offer most of what is needed for an enjoyable time. There is plenty to see and do in the local area. Owners of the site are very friendly and there when needed. Beautiful views of mountains and shorelines are guaranteed. Great location for a dog friendly family break, our second time here and we will be back again. The owners are very friendly and welcoming too! I thoroughly enjoyed a relaxing week in Appin. The lodge was very comfortable and had everything you could need during your stay and the view from the sitting room area was beautiful in autumn colours. The outside deck would be a lovely spot to sit on a summer day. The location was great for a number of reasons - great views and lots of lovely walks all round the area, especially good when you have your pet with you. The lodge is located between Oban and Fort William so there are loads of things to do, see and visit in close proximity. A lovely location. Perfect for visiting fort William, glen coe and Oben. Would recommend this accommodation to others. Superb views across Loch Creran and easy access to places such as Glencoe and Western Isles. Jim was a friendly host - provided very helpful travel and sightseeing advice. Thoroughly enjoyed our stay - recommend the nearby Castle Stalker View café. Spent a lovely week here. Perfect accommodation for us and our dog. Good walks close by. Can highly recommend. Another short break in Appin. Again, a wonderful few day's in gods country. Weather great apart from 1 day and we have again enjoyed staying at the Fox Den Lodge at Appin Holiday Homes. Great location and at an affordable price, all you need for a short break in the area. Will be back again. We had a great time. The House was really comfortable and had an amazing view. The service was very nice and helpful! Very nice lodge with direct view on the loch.Perfect like every time.We'll book another year. Thanks for the lovely review and so glad you enjoyed your stay with us again. Thanks also for the lovely gifts you left at reception. Hi we stayed at Fox Den for 3nights.The accommodation was freshly decorated, very clean,compact but very adequate.The area was excellent with access to cycle path 78 on the doorstep excellent for dog walking.The staff were very friendly and seemed to enjoy their business.Winter opening hours for shops and hotels would be good additional information as Creggan Inn was shut mid week and shop at Port Appin closed at 1. I have stayed in better self catering for less money. It was ok but not brilliant. No towels when we arrived and none appeared until the evening after we had checked in, by which time we had gone and bought some so we could have a shower. We were compensated for this with a written apology and a couple of mini packets of cheap biscuits. The location is nice but i dont think i would stay again. Having done self catering in lots of countries i do think Scotland does not score well in terms of value for money. Good location, beautiful view on the loch, rather expensive and old lodges which could use an update. We only saw Julie a few minutes, never met the caretaker/owner. Nice suggestions in the information booklet, with great descriptions (stoeiers in faxt!) of walks. We stayed in the Fox Den for a weekend and the lodge surpassed our expecations. Clean, modern and comfortable in a quiet and beautiful location. Jim and Julie were fantastic hosts through out and we will most definitely be back soon. Schöne Häuschen mit guter Einrichtung und Lage. Kann weiterempfohlen werden. Einzig die Toilette sollte man anschrauben und die Brille richten. Ist ein bisschen wackelig. Aber sonst top. Love the place we had in the upper cabins. We didn't get any time to get on the deck, as the Scottish climate endured - with the rain. The view from the cabin was beautiful, overlooking the loch and the hills beyond. Even the sheep provided great background noise. I would recommend staying here. I'm "OK" on comfort - the beds are great, but the two couches are not very nice to sit upon. Close to Oban and ferries. Excellent places to eat. Friendly owner. Wonderful views. Accommodation clean and very cosy. Good cooking facilities. Comfortable beds. We had a great stay albeit we only really slept and had breakfast at the lodge, we were too busy climbing Ben Nevis and exploring. The lodge is a short walk to the highly recommended Creagan Inn. Had a fantastic stay at appin lodge. great location and we will be returning for sure next year. exellent views from the lodge perfect for breakfast in the mornings. House is clean, lovely and just near the sea. Had a great holiday some aspects of the property could do with upgrading,the view was excellent.The hotel&bar was nearby, and the food was very good.We could'nt find anyone when we arrived to let us into our chalet,so had to wait,we ended up going to look for them, I think that could be improved. We spent a very pleasant week next to a loch and with beautiful views. We arrived late and Jim Weir was there excepting us. Thank you very much for this welcome! We booked 4 times the fox den and we'll do it again! What a lovely location and the weather we had just made it extra special! If you are looking for an excellent place to chill out for a few day's and you are lucky enough to get the weather too then, this is the place to be! Lots to do and see in the local area and Oban and Fort William are just a short drive away!! Make sure you take in the Creagan Inn, just a short walk away, and the Peirhouse hotel in Port Appin, the food in both is just first class! The view from the Lodges is second to none, we will definitely be back!! Excellent customer service and excellent views from the log cabin. If you have any problems there quick to respond. If your not sure what you want to do or want ideas of what to visit there's a folder of good local things to do in your holiday home. There's good local walking areas and also a pub less than five minutes away. This was a last minute booking so there was little choice. Although I would say the interior has had a recent refurb it has been done in a slap dash and hurried manner! There was paint on the sofa and lamp shade from the paint job and the curtains hadn't even been ironed ! Although it wasn't dirty it was unloved and way below my standards. There were dead flies on the windowsills, and the bathroom tiles were in need of a good bleach which I treated them to and came up lovely! The toilet seat was obviously new but was too small for the toilet.The shower was a pathetic trickle. On arrival one of the beds in the twin room had a very tired and stained duvet cover and no sheet on the bed. The owner did promptly rectify this. However, I also mentioned that there was only one out of three light bulbs working in the kitchen which was also seriously covered in cobwebs. He said he sort it out. He didn't! The bathroom was ,like the rest of the place compact with no where to put anything. It was just uncomfortable. It did have amazing views but for someone who lives on a pedestrianised street way too near the main road with heavy goods vechiles waking me from 5 am! The exterior was also in need of a good clean down. Covered in all sorts with the light above the door being an inch deep in dead things. Yes I'm in the country but there really is no excuse. We had warned our girls that there would be no wifi but even I would have liked it without having to walk to "games room" just to look up local information etc. In this day and age it really is a must have! We had a great 2night break here, warm welcome, comfy lodge, stunning scenery. Lovely walking area. Highly recommended and hope to be back next year! We also really recommend Appin Boat Tours. Excellent day out. Lodge was spacious and practical. Jim at reception really very helpfull and friendly. The location is great between oban and glencoe. Only thing the road A82 a bit noisy during the day. Appin holiday homes are in a fantastic location and the views of the loch are spectacular. We literally just slept at the chalet for a few hours over two nights as it was a whirlwind visit to Scotland solely to climb Ben Nevis. Due to distance we had to travel we did not arrive at the chalet until well after the booking in time had passed. A quick phonecall to Jim the owner however and he was very understanding. He explained where the chalet was, opened it up and turned the lights on for us. The chalet itself was clean and seemed quite nice. If you are looking for a self catering style place in a good location then Appin are well worth checking out. Lovely location, though the main road was the 'fly in the ointment'. Easy access to good walking, climbing and sightseeing. The local hostelry was OK, food was tasty but we thought it expensive for size of portions. Only downside of 'Fox's Den' was the close proximity of the toilet to the bath. With six feet + family members it was a challenge. Overall though a good time was had by all. The location of Fox Den is excellent.Wonderful views and easy access to Fort William and Oban. The lodge was fine with adequate crockery, pots and pans etc. We ( 58 and 60 yr old) found the beds and settee were not very comfortable and there was insufficient leg room between the bath and toilet. There was no internet access. 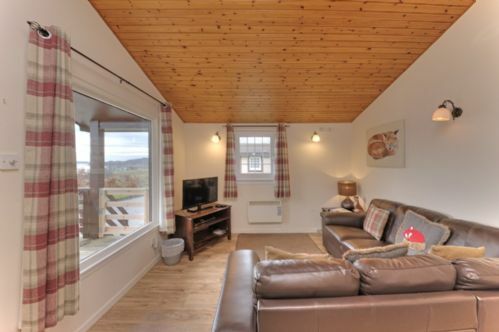 I found Appin Holiday Homes whilst searching for dog friendly accommodation in the area. I didn't expect it to be so perfect and in such a beautiful and magical location. We loved it and didn't want to leave! We even found a little friend in the shape of cheeky little Chaffinch knocking on the window asking for scraps. We had a wonderful and friendly welcome and the lodge was a perfect little home from home. I would recommend Appin Holiday Homes 100% and would love to return for a longer stay in the future. Appin Holiday Homes provided us with a great lodge which was perfect for our stay. Lovely views, grounds and lodge were so clean and well cared for. The kids loved the tree swing, the dog loved the walks and we loved the peace and quiet! Great location with the water for the dog to swim and the kids to explore. We will hopefully be back! We have been returning to Appin Holiday Homes for 30 years and hope to do so for many years to come. Accommodation and setting are perfect for us. We have never been disappointed.